If you're looking for great lawn care near Bergen County NJ, look no further than North Eastern Tree Care near Bergen County, New Jersey. We specialize in lawn maintenance, mosquito control, and tree and shrubs care. We are in the industry of tree care and property maintenance. The thing that makes us your best option and makes us different than the other lawn care companies is the fact that we spray tree, shrubs and the lawn as well as treat for insect and disease by using a natural, organic product. 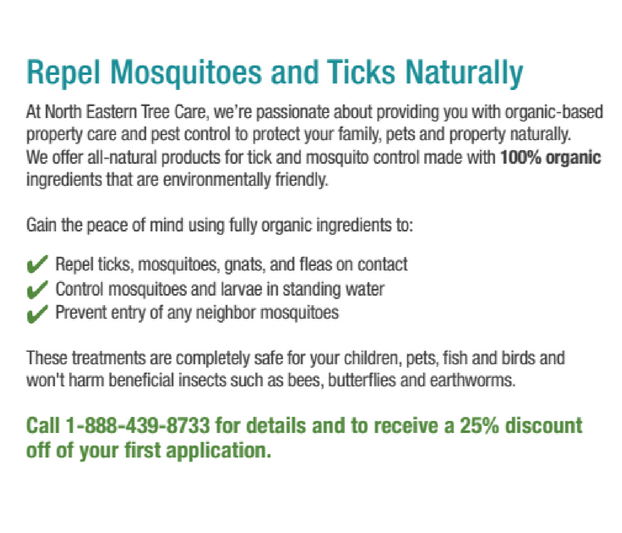 North Eastern Tree Care provides natural mosquito control, along with tick, flee, and fly services. We were established in 1996 because we saw a need for providing natural and organic products for the health of trees and properties. Some of our employees have been with us for as many as 18 years. Together all of our employees have an average experience of 15 years. We have serviced over 22,000 customers in New Jersey, New York and Connecticut. One of our key services is insect and pest control. This services a wide spectrum of foliating and chewing insects which expose properties to disease such as alphas, mites, caterpillars, etc. We use natural and organic products for controlling ticks and perform disease control on trees using fungicides to eradicate a variety of pests. We cannot stress enough that we only use a natural and organic product. We also offer deep root feeding which is a root injection for feeding plants. We also offer full lawn care using natural products to fertilize and treat lawns. We are a full service licensed and certified landscape maintenance business that provides insects detection and protection, treats existing problems, and performs regular lawn maintenance and preventative programs to reduce cost of tree removal or replacement. All of this is done at an affordable price. As an accredited Better Business Bureau company with an "A+ Rating", North Eastern Tree Care has earned the highest accolades from our customers and peers due to our knowledge of arboriculture, our professional customer service and our involvement and education to the community as tree care experts. 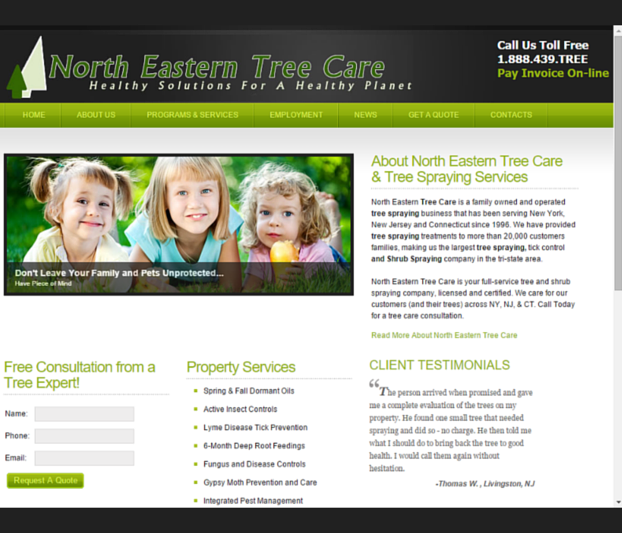 If you're looking for professional lawn care near Bergen County NJ that cares about the safety of your family as well as the health of your lawn, North Eastern Tree Care near Bergen County, New Jersey is the company for you. From mosquito control to landscape maintenance, our knowledgeable and certified lawn care providers are ready to help your lawn look beautiful. Call us today to learn more about your options.